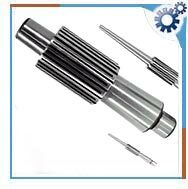 Mandrel is a metal bar around which other metal may be bent. Mandrel is a term that can refer to an object used to shape machined work; a tool component that grips or clamps items to be machined; or a tool component that can be used to grip other moving tool components. A potent example of mandrel is the clamp that a lathe uses to hold the piece of wood, metal or plastic to be machined as it is turned. Mandrels are used to hold circular saw blades, buffing wheels and sanding discs onto drills, circular saws and similar power tools. While most mandrels are driven by direct connection to a motor, other mandrels are driven by attachment to a pulley driven shaft.